Please contact us at (201) 666-7100 or email us at mdpent@mawn.net for more information. Must have attained minimum black belt in any other system or style. Must show proof of current rank. Complete 4 weekends of training during a 12 month period with each weekend consisting of 20 training hours. Cost of Certification: $2400 ($600 per weekend). This program is specifically designed for Black Belts of any rank with documentation of their rank. Are you tired of seeing so many certification programs, promising this and that, and everything under the sun? Did you ever look at their background? What Lineage do they have? What Rank have they actually attained? What System are they really teaching? Who truly was their Master Instructor? Do they still work hand and hand with the people that taught them? What is their history in the arts and most important of all, are they loyal to their instructor today? 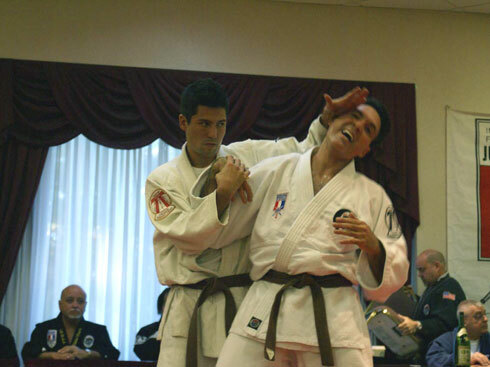 For years, the most trusted name in the Martial Arts and in particular Jujutsu has been DePasquale. The power of Yoshitune Jujutsu has been harnessed and the combat side of this traditional system is now available to be instructed exclusively to black belts. Adding Jujutsu to your schools curriculum is a great way to bring in additional students, and the DePasquale name. Now, you have the opportunity to pass this level of excellence on to your students. In addition to certifications held at the Hombu, school owners have an opportunity to host their own certification at their dojo. 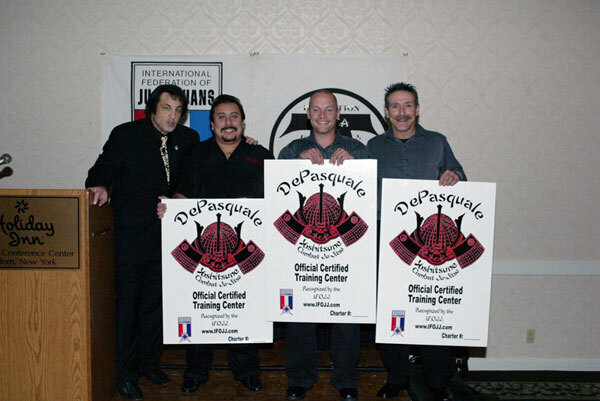 The Host of the DePasquale Combat Jujutsu Certification will hold the Certification on 4 mutually agreed upon weekends. At the conclusion of the final weekend of Certification Training, you will take an IFOJJ 1st Degree Black Belt Certification Test in the DePasquale Combat Yoshitsune System. The requirements of this test must be met to pass the exam. No Certification will be awarded until successfully passing the exam. In addition, you will automatically become an official member in good standing in the oldest Jujutsu organization in the United States, the International Federation of Jujutsuans. If you are currently a School Owner, you will have the opportunity to become a Chartered School in the IFOJJ. 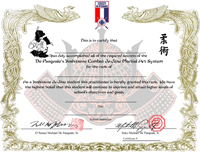 You can also continue learning with the Traditional Waza, which Michael DePasquale, Sr. and his instructor, Junji Saito, taught throughout the 50’s, 60’s, and 70’s and continues today, through his son Michael DePasquale, Jr. You will also be entitled to use the IFOJJ Logo in your school and in your advertising. 4 Prescheduled Weekends – Friday / Saturday / Sunday. 20 Hours of Training included per Weekend. At the conclusion of the 4th Weekend the Certification Test will be administered. 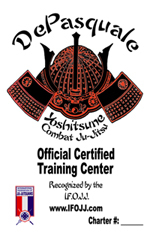 All attendees who complete the course and pass the required test will receive a certified diploma of completion in the Yoshitune Combat Jujutsu System. All certified black belts must read and sign the Combat Yoshitsune Maintenance agreement. The agreement is designed to formally state Soke DePasquale´s expectations, to maintain the integrity of the system, and to explain the requirements for promotion to nidan through godan. Prices are: $700 per weekend (Four weekends in all). Prices may vary according to attendance, call for info. If your school is interested in hosting, contact us at either 201-666-7100 or go to www.depasqualejujitsu.com. Upon Graduation, Certified Instructor will have the necessary skills to teach in any venue appropriate for this activity. You will also receive a certificate and have the opportunity to purchase an Official Training Center Poster for your dojo. If you are interested in sponsoring a certification program for blackbelts or seminars for all students, such as the defensive tactics for police, fighting and falling for film, SAFETY, and his combat and traditional Ju-Jitsu contact Michael DePasquale Jr at 201-666-7100. Black Belt test. Each individual will be tested formally.